As a complex, the B vitamins are essential for the proper functioning of the nervous system and are perhaps the most important nutritional factor for healthy nerve cells. The B vitamins also play a role in the conversion of carbohydrates into energy, in the metabolism of fats and protein, and in the maintenance of muscle tone in the GI tract. The B vitamins support the integrity of the skin, hair, and liver. This balanced combination of functionally interrelated B vitamins provides wide ranging benefits, yet is specifically supportive of the nervous system. Vitamin B12 (methylcobalamin), supporting healthy nerve cell activity and DNA replication. Vitamin B12 is a vital component of the methionine synthase pathway, which along with folate and vitamin B6 supports healthy homocysteine metabolism and S-adenosylmethionine (SAMe) production. Love the small capsule size compared to other B Complex supplements. Great value! This is my go to brand for supplements. Good quality and price. 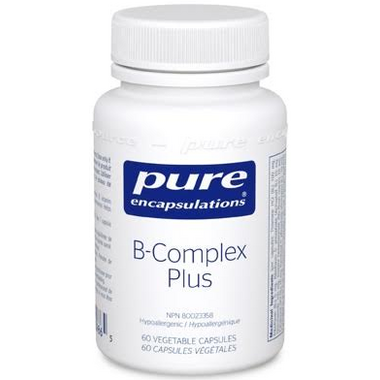 I take this vitamin B complex with the thyroid support from Pure Encapsulations. The benefits are great with this combination. I feel much better since started taking a few of the PE products. High quality supplement, very satisfied. I take b complex daily because of migraines with visual auras, and this has drastically reduced the frequency with which I get them which makes me think itâ€™s quite pure / high quality. I tried this hypoallergenic brand because of my soy allergy, and it doesnâ€™t trigger any reactions at all. Highly recommend! I have been taking Pure Encapsulations B-Complex consistently and have been very happy with the quality of this product. The capsule size is also relatively small, making it easy to swallow! This has become my families go to B Complex. The ratios work for us. Happy that Well has such great delivery service which makes it super easy to reorder. Great product, rest assured getting a top quality product with this brand. Was warned urine may turn bright yellow and it did. Only have used a few weeks, but like so far. YIPEE! I finally found a B complex supplement that I can digest & assimilate well!!! I've been trying products for about 5 years and each one I tried gave me an allergic reaction. This is the only brand I can use. I am soooo happy!!! I was pretty close to giving up my search. It was recommended by clerk at my health good store but I'm buying here now because it's more cheaply priced. Win, win! 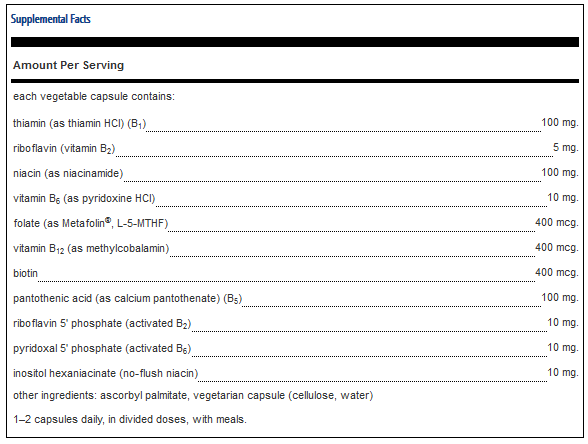 I have a sensitivity to folic acid (the synthetic version of folate) found in most supplements. Pure Encapsulations is the only brand that has a filate that is safe for people woth this type of sensitivty. Being able to take B complex supplements has completely transformed my health. Well.ca seems to be the only way to get these in Canada. I needed a hypoallergenic b vitamin because of food sensitivities. I found that was not an easy task to find. I found this brand, and have been taking it for about 6 months. It works very well, and I will continue to use it. I can tell the difference between not taking my b vitamins and taking them.